On his third full-length #album, singer/songwriter Allen Stone proves himself deeply devoted to making uncompromisingly soulful music that transcends all #pop convention. Stone’s debut for Capitol Records, Radius marks the follow-up to the Chewelah, Washington-bred 28-year-old’s self-released and self-titled sophomore effort, a 2011 album that climbed to the top 10 on Billboard’s Heatseekers chart and gained acclaim from renowned #rock critic Ann Powers (whose NPR review hailed Allen Stone as “meant for those of us who like our R&B slightly unkempt and exceedingly feelingful”). Made in collaboration with Swedish soul singer/songwriter/phenom Magnus Tingsek, Stone’s latest batch of #songs capture the warm energy of that creative connection and transport the listener to a higher and more exalted plane. Culled from several dozen songs penned through a year and a half of constant #writing and refining, Radius bears a title that reflects both its scope and intimacy. “The radius is that line extending from the center of the circle to its exterior,” says Stone, “and in a lot of ways this album is about getting out things deep inside—whether it’s love or insecurity or joy or frustration about things going on today.” Along with immersing himself in a #songwriting approach that involved unflinching examination of “some very dark and negative moments in my life,” Stone shaped the #sound and feel of Radius by pushing himself to “get past the boundaries of what I felt comfortable with, so that I could progress into a whole new level of creativity.” Despite that sometimes-daunting process, Radius wholly reveals Stone’s easy grace in blending everything from edgy soul-pop and earthy folk-rock to throwback R&B and Parliament-inspired funk. Radius first began to come to life back in the fall of 2013, when Stone headed to Sweden to join in a writing session with Tingsek. “His #musicality is so outside-the-box, and it really stretched me as an artist,” says Stone, who’d tapped Tingsek as one of his opening acts for an 85-date headlining tour in 2012. “We just kept on throwing a wrench into the works and tried to create something that’s the complete antithesis of what you’d expect from pop music.” After #recording the bulk of the album in Sweden, Stone rounded out Radius’s #production at his own #studio in the woods of northeast Washington and in L.A.-based sessions with producers like Benny Cassette (who’s previously worked with Kanye West) and Malay (a co-producer on Frank Ocean’s channel ORANGE). Like many of his own musical heroes—Stevie Wonder chief among them—Stone pulls off the near-magical feat of channeling a weight-of-the-world sensitivity into his songs while still radiating hope and promise. And though that depth of consciousness feels transmitted from a more golden era, Radius continually hones in on issues both timeless and of-the-moment, with Stone’s breezily poetic #lyrics touching on topics ranging from rampant materialism (on the tenderly string-accented, harmony-soaked “American Privilege”) and the toxic takeover of technology in #art (on the gutsy and groove-heavy “Fake Future”). “That song’s mainly about how technology’s infiltrating music in a way that’s making it less and less human and taking all the heart out of it,” Stone says of the latter track, a soul-pop powerhouse peppered with playfully cutting lines like “Rock stars pushing buttons/Few actually play/City wasn’t ever built on lights and Special K.” And as evidenced by Radius’s lush yet raw sonic landscape—wherein the only hint of synth comes from a Moog analog synthesizer—Stone stayed true to his pledge to “keep fakeness completely out of this record” and rely entirely on live instrumentation. Equally introspective and outwardly searching, Radius also finds Stone exploring intensely #personal matters, such as #depression on the stark and lovely, acoustic-guitar-woven ballad “Circle” (“That one was written at a pretty dark time for me,” Stone points out. “It’s about how depression can put you into a kind of circle, where you’re just trying to find a way out but it keeps on leading you back inside”). Showing his skill at crafting a killer love song as well, Stone looks at heartbreak and regret on the aching, electric-piano-infused “I Know That I Wasn’t Right,” slips into hopeless romanticism on the dreamy R&B pastiche “Barbwire,” and unleashes some starry-eyed affection on the dancefloor-ready “Symmetrical” (a sample lyric: “The angle of your spine/Is sending lightning bolts down mine/When those molecules combine/It’s astronomically divine”). And in tracks like the ultra-catchy album-opener “Perfect World” and the fiery, horn-laced “Freedom,” Radius unfolds into epically joyful #anthems that show the full range and power of Stone’s #vocals. Stone started working those vocals as a kid, thanks largely to his parents’ influence. “My father was a minister so I spent about half my childhood in church, watching my mom and dad sing together and lead the congregation in song,” he recalls. By the time he was 11 he’d picked up a #guitar and written his first song, and soon began self-recording demo tapes to pass along to classmates. Although Stone enrolled in bible college after high school, he quickly dropped out to move to Seattle and kickstart his music career. “I had an ’87 Buick and I’d drive up and down the west coast, playing any gig I could get just to try to put my music out there,” he says. At age 22, Stone self-released his debut album, 2010’s Last To Speak. But it was his self-titled follow-up (on which he joined forces with former Miles Davis keyboardist Deron Johnson) that ended up earning him serious recognition. 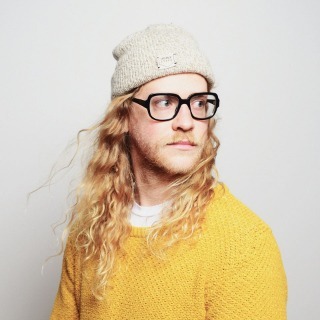 Along with entering the top five on iTunes’ R&B/Soul chart after its digital release, Allen Stone prompted him to score appearances on such late-night talk shows like Conan and grace the pages of publications like the New York Times (whose chief popular-music critic Jon Pareles praised Stone for possessing “a tenor voice with the eagerness and frisky syncopations of [Stevie] Wonder”). And upon partnering with ATO Records for a physical #release of his self-titled album in 2012, Stone soon turned up on the likes of the Late Show with David Letterman and landed a gig as the opening act for soul legend Al Green. In the midst of all the buzz, he also took up a grueling touring schedule, tearing through nearly 600 shows in just two years.